FTL-but-pirates roguelike Abandon Ship just sailed over the edge of its own world. A big update has added sea forts and floating outposts to the game of high seas and low life, along with a bunch of other stuff. There are new weapons, a bigger crew size, trade routes to raid, and the added danger of being marked as “wanted”, leading to bounty hunters being dispatched to chase you down. In other words, you’re going to be looking at the world as a chance for loot. Developers Fireblade Software are calling it the “Perilous Bounty” update, instead of the “Pirate’s Eye Patch”. The fools. You can see all the details on the official site. But the big new thing are the sea forts. These are big stone barnacles of fury that stick out of the water on the world map and may fire on you if you come into range. If you get caught in a fight with another ship while in range of an enemy fort’s “Mega Mortar”, then it’ll rain down bombardments from off-screen in the middle of your scrap (and possibly your enemy too, depending on their allegiance). It’s a lot like the volcanoes which already exist, except you can also approach these forts and take them on. To defeat them, you have to disable that Mega Mortar in some way. And while they’re designed to be hard to beat, you can also “get in super-fast and finish the battle quickly” by boarding the fort with a strong, well-armed crew, say the devs. The forts won’t always be upset with you. There are neutral ones that only fire on you if you’ve been a naughty sailor. This is where the new “wanted” levels come in. If you attack neutral forts or do a lot of “piratical acts” you’ll now start to gain attention. Which means a new type of enemy. There are also now trade routes on the world map. Basically, these are long dotted lines that weave across the water. 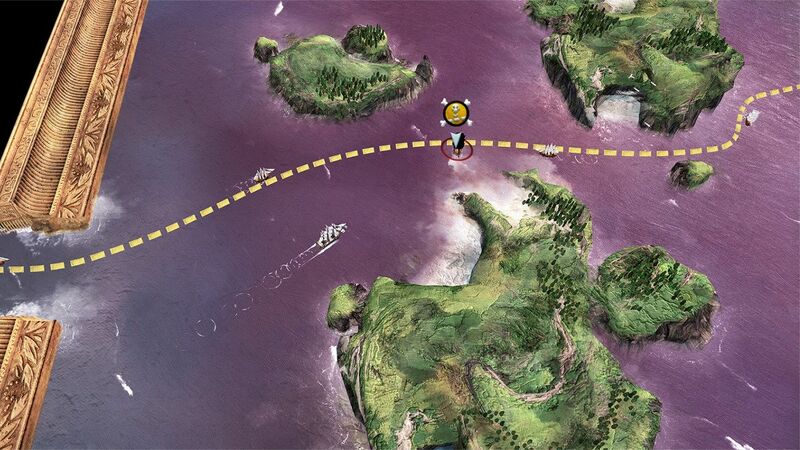 Resting your ship on these shipping lanes and pressing a “raid” button will let you fill your hold with ill-gotten coin, but also raise your wanted level. However, nicer captains might want to chase other NPC pirate and cult ships away from the trade routes, which lowers your wanted level. Like being a nice sea policeman. The downside to so much avasting is that ports will now shut their harbours to any player who wears too many eye patches. To make up for that, there are now floating outposts where you can stop and rest if you’ve been deemed too unruly for polite society. These makeshift shelters aren’t as useful as ports, but you can pay off your fines, boost morale, buy supplies and repair your hull. There’s a fair whack of other changes, including a flame-throwing gargoyle you can use as a weapon, and anti-boarding spikes. Crewmates will have unique skills, such as the Navigator, who now reduces an enemy ship’s accuracy as long as they are on the steering wheel. The world map will also repopulate with baddies if you return from one area to another, and the Kraken that hounds you through your journey also has some slimy new moves. Bad news: old save games won’t work with this new version. But if you’ve been long gone from its shores that probably won’t matter. Alec complained about a lack of variety in his Abandon ship review, so this might be just the peg leg it needs. Previously it eased up on the harshness, adding save points and making it so that your crewfolk didn’t croak it at the first sign of a cutlass. meanwhile, future plans include adding a new region with its own flavour of sea trouble. But we’ll have to wait to see more of that. My bet is on “sewer level”. Tagged with Fireblade Software, Abandon Ship.